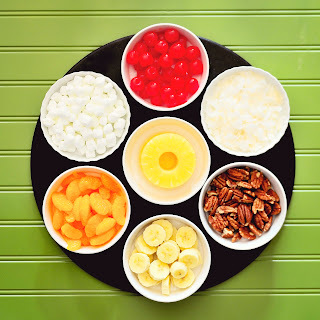 Ambrosia Salad was a childhood favorite. I just never realized it. The salad I grew up with was referred to as fruit salad with whipped cream. Maybe amongst the adults the real title was shared but for those younger than 10 pretty much used the title already stated. It varied from year to year. 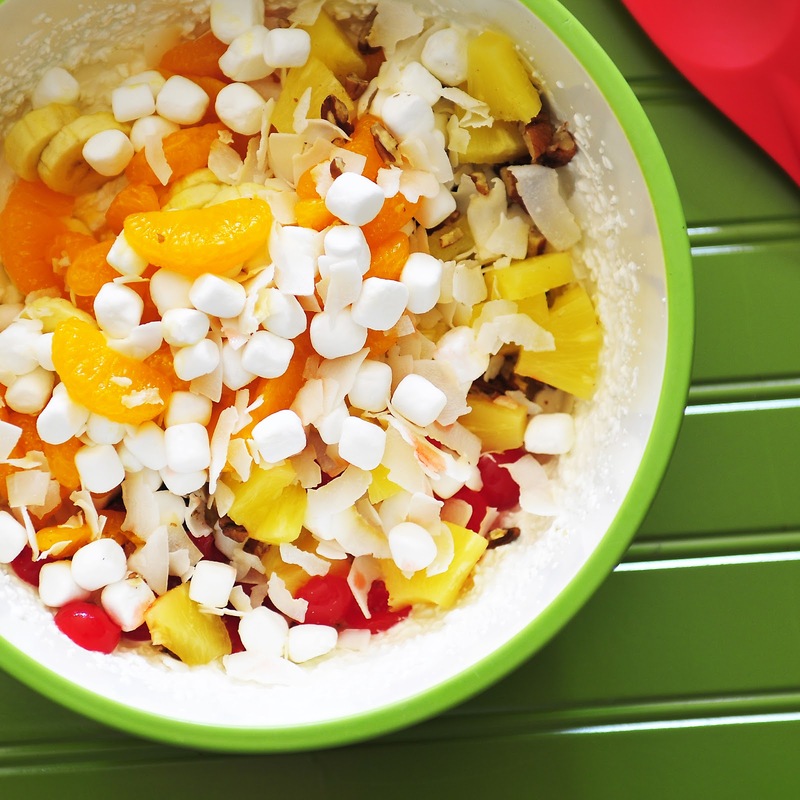 I honestly don't recall having coconut or marshmallows too often in our fruit salad. I am sure this was because of a personal choice made by my grandmother. In general, we did not each much coconut. I can only assume it was not a family favorite. 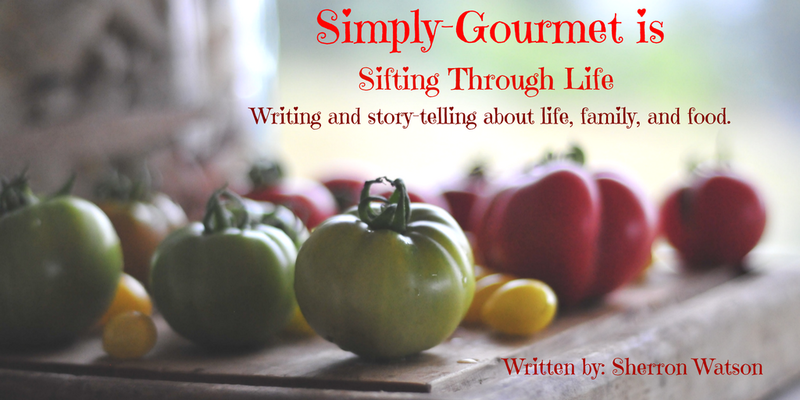 I was delighted to learn that for our Sunday Supper group we were going to explore the recipes that focused on Then and Now. I very much remember the Then of my life and relish in the Now every day. My own little family does not love this salad as I did whilst a youngster. It may be the nuts or the whipped cream, who knows. On rare occasions I do make this in a much smaller size and devour it over the course of a few days. Can you blame me? Nuts, mandarin oranges, pineapples, bananas, coconut, marshmallows and bananas...ooh la la. How could I have forgotten the maraschino cherries (the best part in my opinion). I took the liberty of using the ever coveted color scheme of the 70's--orange and avocado-- to shoot my pictures this week. I simulated a Lazy Susan by using my pizza stone. I have not, in my lifetime, ever owned a Lazy Susan ( I always felt bad for Susan). We all have different idea's of what--Retro or Then and Now-- are in our own lives. From my point of view if was the 70's and to others it could be as far back as the 40's, 50's or 60's. Only you can decide which decade you want to revisit in terms of Then and Now and Sunday Suppers. Below you will find the list of our group along with their selections. I cannot wait to see which point in time they selected their dishes from, and to learn if they updated the recipe or kept it as is. In a large bowl combine first 7 ingredients. In a small bowl combine the last 3 and beat until cream is thick. Combine the two bowls. Store salad covered and in the refrigerator until ready to serve. NOTE: The size of can's I used for the mandarin oranges and pineapple were between 10-10.75 ounces. The cherries, I purchase the smallest bottle I could find. All of the listed amounts can be adjusted or omitted on what your family likes or does not like. I actually enjoyed the marshmallow and coconut after years of not having it made this way. NOTE: If you would like to use whipped coconut milk in place of the whipped cream here is a link to how to do that: GO HERE. My mom always called this Fluff lol but we loved it all the same. You pictures are gorgeous! Thank you Shannon. I like that name! Fluff. I may have to borrow it. You've just helped me retrieve a taste memory with your post. 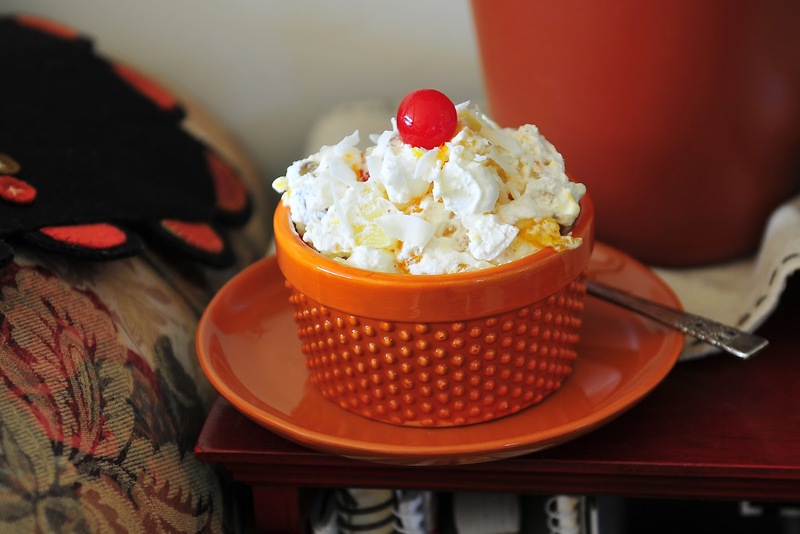 My mother made ambrosia for company, and that's when I fell in love with it. My siblings and I loved it so much, it was always hidden before the company arrived so that we wouldn't devour it on the spot! That is too funny! It wasn't unusual for my grandma to unwrap the dish and find finger marks where we had scooped it out…LOL I love that food gives us the opportunity to revisit fond memories. I loved this salad as a child. I think there are tons of different versions of it out there. I totally forgot about ambrosia salad! Yours is so cute!!! I want to make one now!! This is a family favorite! Yours is beautiful! Very beautiful. I can't say that I have ever tried, but it looks fun. I absolutely LOVE your retro color scheme - exactly what I picture when I close my eyes and conjure up that time frame. And yes, my grandma used to make Ambrosia salad for every holiday. But everybody sort of stopped eating it, so she stopped making it. I think I'll have to surprise her with this beautiful salad at our next family get-together! Thank you! I bet your grandma will love that you thought of her. Enjoy the salad. Wow. This takes me back! My mom made this for a few church potlucks! It was always a treat! 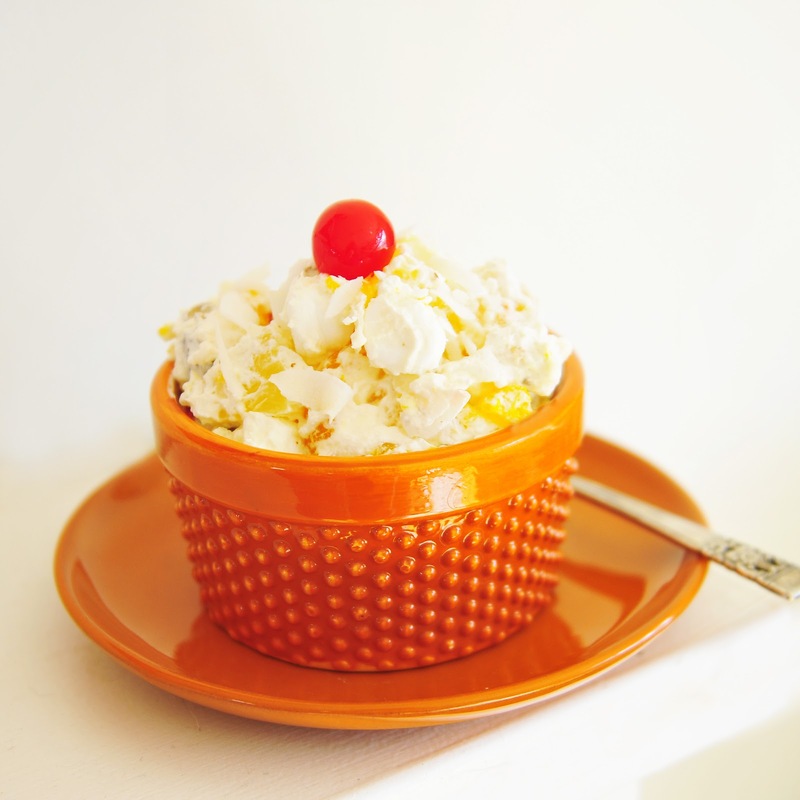 I have never had ambrosia salad before, but your recipe makes me want to give it a try - sounds fab! I always think of this when I think retro. I can't count how many BBQs have had this! 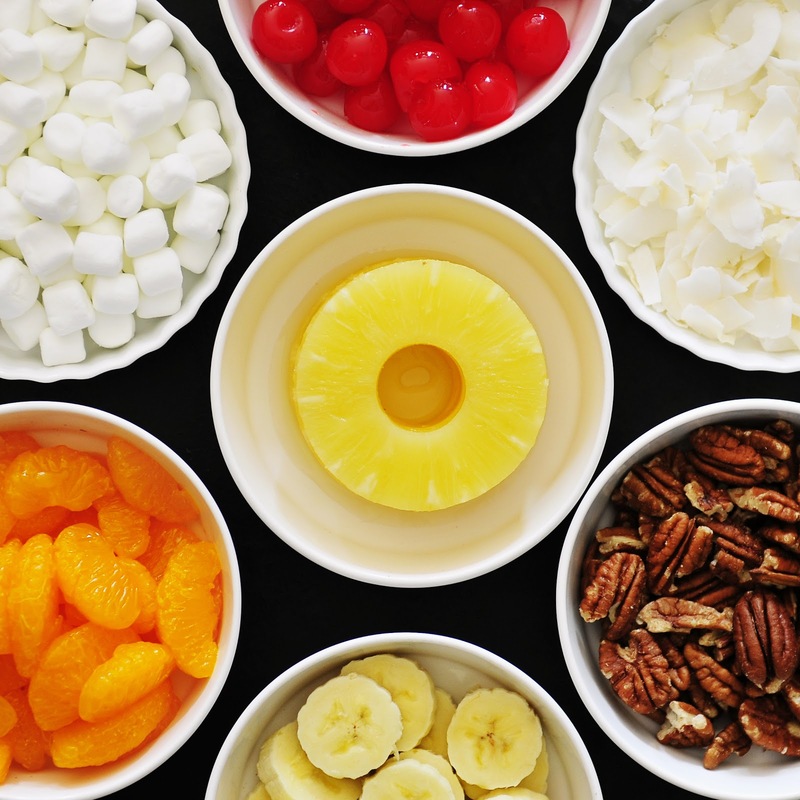 My mother always made ambrosia salads for parties when I was growing up and yours looks delicious! Very nice Sherron! Loved that you used those retro colors! This is a great salad! Oh wow - this was one of my big favorites as a young teen. I felt soooo grownup eating it with my parents. Your's looks wonderful, and I love the tip of using coconut milk. LOVE IT. I heard about this dessert but never ate it. But then cream, fruit and nuts, what´s not to like? The colors are wonderful Sherron! We had this on our table every big family Easter celebrations...so good! I remember coming home from college and describing this salad to my mom. It was one of the dorm food offerings that I always took two helpings. I can only imagine your version is even better than my memories! YUM! That is the prettiest ambrosia I've ever seen! I never could get my mom to make this for me, but I definitely enjoyed it if it was offered anywhere we went! Ambrosia salad, my my my I haven't thought of this forever. Nicely done! I love coconut. Throw in the whipped cream and I will be licking the bowl clean! Your Ambrosia salad is way pretties then any of the ones I've eaten! We always just called it fruit salad. I love the tropical fruits. When I was a kid the family would always make it on Thanksgiving with the freshest produce you could find from the California farms. With the infusion of coconut this could be almost a Caribbean style ambrosia salad. A kid favorite. Anything that requires marshmallows is a hit in our house with twin 6 year olds at the table. Very colorful Sherron. An all time favorite. no I can't blame you, it sounds and looks so refreshing. So cool that you took the picture in the 70s theme, it makes it all the more irresistible and fits well to the retro topic. Those beautiful pictures of all the ingredients already tempted me to make it soon! Wonderful recipe, Sherron! Such a great recipe, Do you have some recipe on some Italian Food? I would like to try them if you got. Like a Pasta recipe that's been made by you. This is so lovely! I love that you added shredded coconut and THANK you for that link for whipped coconut milk! I'm totally pinning this! This is one of my husband's favorites, but I've never really made it for him. He would love it! And I gotta say how much I adore your photos. You've got a great retro vibe going on! This looks so much tastier than the ambrosia salad I have seen. Love the presenstation and photo is gorgeous! I remember this salad, but I haven't thought of it in years! Thanks for the reminder. I doubt The Picky Eater would like it...good, more for me! A consultant can be challenging because there are multiple ways that a student loans plan. this road before, we'll do it again. 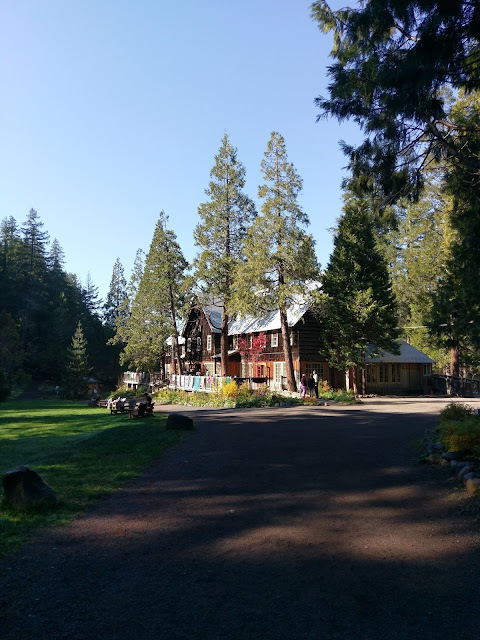 Without prompting, individuals would relate sometimes quite lengthy narratives to the group - with your contact information and so on, information journeys immediately, and eventually the fee continues to accumulate.